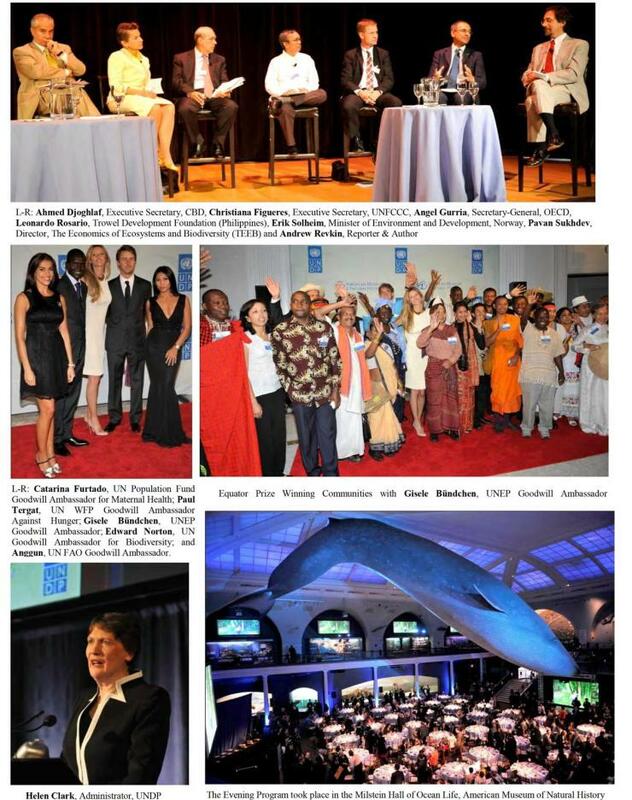 UNDP, together with a range of partners, organized a High Level Event on Biodiversity, Ecosystems and Climate Change: Scaling Up Local Solutions to Achieve the MDGs in support of the UN MDG Review Summit on Monday 20 September at the American Museum of Natural History in New York. The event attracted over 500 participants, including: heads of state, ministers and members of the diplomatic corps from more than 60 countries; celebrities serving as UN Goodwill Ambassadors; top officials from UN agencies, civil society organizations, foundations and the private sector; leading academics and experts; and the media. The evening opened with a Policy Forum which focused on the critical linkages between biodiversity loss and degraded ecosystems, climate change and MDG achievement, and the need for a more concerted effort to scale up proven front-line solutions advanced by local and indigenous communities and organizations. Panelists agreed on the need for integrated policy approaches that tackle these challenges simultaneously, while also creating the enabling conditions for effective local action. The Policy Forum was moderated by Andrew Revkin, award-winning environmental reporter and author, and included Ahmed Djoghlaf, Executive Secretary, Convention on Biological Diversity; Christiana Figueres, Executive Secretary, UN Framework Convention on Climate Change; Angel Gurria, Secretary General, Organization for Economic Cooperation and Development; Leonardo B. Rosario, Executive Director, Trowel Development Foundation in the Philippines; Erik Solheim, Minister of Environment and International Development, Government of Norway; and Pavan Sukhdev, Director, The Economics of Ecosystems and Biodiversity (TEEB). 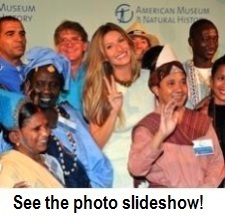 Following the Policy Forum, a reception was held in the Hall of Northwest Coast Indians, which featured statements by Ted Turner, Chairman, United Nations Foundation; Gisele Bündchen, supermodel and UNEP Goodwill Ambassador; and Anggun, FAO Goodwill Ambassador. Charles McNeill, UNDP, served as Master of Ceremonies. The evening program opened with a keynote address by UNDP Administrator Helen Clark and the launch of UNDP's "Local Capacity Strategy: Enabling Action for the Environment and Sustainable Development." "Poverty reduction strategies and efforts to mitigate and adapt to climate change cannot succeed without being rooted in the demands, capabilities, and actions of local organizations," said Clark. "Biodiversity conservation will not be effective without the active engagement of local communities, which comprise the primary daily users of nature's resources. This underlines the importance of empowering local actors for MDG acceleration." Following the keynote address, former Senator Timothy Wirth, President of the United Nations Foundation, announced the establishment of the Global Partnership for Community-Based Adaptation (GPCBA). Working through the UNDP/GEF Small Grants Programme, the new partnership aims to promote and expand support for community-led approaches to climate change adaptation. 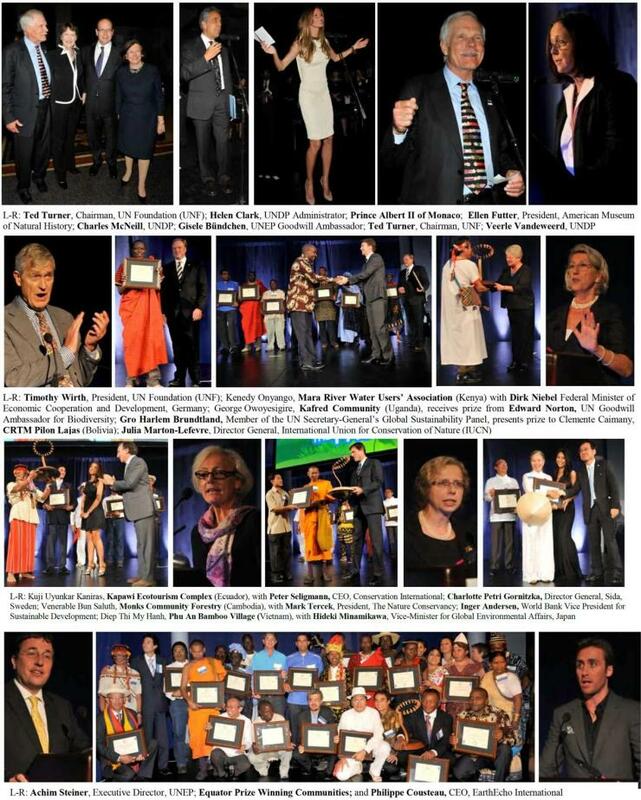 The centerpiece of the evening program was the Equator Prize 2010 Award Ceremony. Twenty-five local and indigenous community groups from across the developing world were presented with the Equator Prize in recognition of outstanding work in biodiversity conservation, poverty reduction and adaptation to climate change. After the award presentations, three community representatives - My Hanh Diep Thi of the Bambou Village de Phu An (Vietnam), Masingita (Mavis) Hatlane of the Makuleke Community: Pafuri Camp (South Africa), and María Alejandra Velasco Perrado from the Consejo Regional Tsimane' Mosetene - Pilon Lajas (Bolivia) - delivered a powerful statement to the audience on the need for greater community voice in national and global policy fora, and the need for more effective partnerships and expanded support to scale-up local best practices. Partner publications related to the event's main theme. Representatives of the Equator Prize 2010 winning communities came to New York from 15-23 September to participate in a Community Summit "dialogue space", where they shared experiences of their work and engaged in UNDP-sponsored workshops on among others: indigenous and community conserved areas; business and biodiversity; ecotourism, marine and coastal resource management; forest management; eco-agriculture; adaptation to climate change; and indigenous knowledge. Nine community leaders were selected by their countries to participate in the UN General Assembly Special Session on Biodiversity as part of their official national delegations. My Hanh Diep Thi, representing the Bamboo Village in Vietnam, was invited by the President of Viet Nam to share a flight back to their country to discuss how lessons from her project could be scaled up. Additionally, Renato Delgado from the Associacão Comunitária Nova Experiência Marítima da Cruzinha da Garca in Cape Verde was invited to present his community's work at a Participation in Planning and Development Seminar at Harvard University.